The legendary Formosa Café has been in Vincent Jung’s family for three generations. Originally opening in 1925 in a red trolley car that once rolled down Santa Monica Blvd. It became the Formosa Café when Jung’s grandfather Lem Quom, partnered with the owner in 1945, and later took full ownership in the 1970s. Recently, Vincent collaborated with Adam Fleischman of Umami Burger and Red Medicine, and his AdVantage Restaurant Partners – Executive Chef Jordan Kahn and Noah Ellis to revamp the venue’s dining menu and rename the iconic spot Red Med at Formosa Café. Inspired by Beverly Hill’s Red Medicine’s Vietnamese-themed menu and bar bites, Red Med at Formosa Café features some of the most popular dishes, including dumplings, spring rolls, bahn-mi, brisket and whole fish to share. My eyes had to adjust quickly as I walked into the dark restaurant to meet a group of foodies. We frequently used our iPhone flashlights to read the menu and snap photos. I was pleased to notice that all of the aesthetic elements of the Formosa Café are the same. 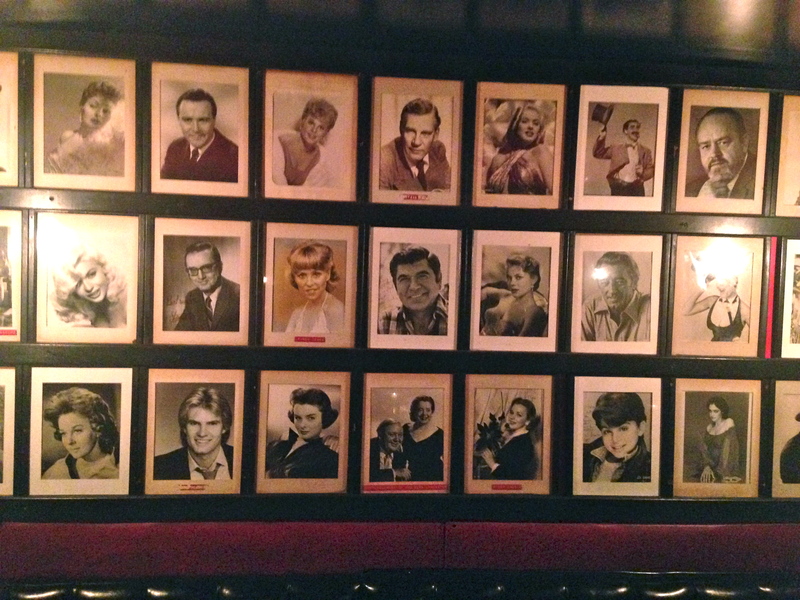 The walls are still lined with over 250 black and white headshots of some of the most famous actors in the world. There is still a display case showcasing a collection of Elvis Presley decanters and statues above his old booth. One of the head bartenders, Billy Ray arrived at our table with some of the classic cocktails that have been added to the cocktail menu. Bartender Matthew Boddie created a ginger daiquiri a la Central, pisco apricot Tropicale and the Singapore Sling for us to enjoy. Billy Ray shared with us that in its heyday, Hollywood romances were known to have blossomed in the low lighting and cozy booths over cocktails. Humphrey Bogart and Lauren Bacall, Frank Sinatra and Ava Gardner, and Natalie Wood and Robert Wagner were frequent guests at Formosa Cafe. Since the Pickford-Fairbanks Studio were next door, actors used to saunter into the waterhole and stay until the wee hours, prompting Pickford to go to the city to help create the “last call by 2 a.m.” city ordinance for bars in Los Angeles. Gangster Mickey Cohen ruled the underground of liquor, women and cash at Formosa Café. His safe was built into the flooring between the two front booths to the left of the front door. Unable to make it home one night, The Duke – John Wayne slept in the largest booth to the right of the front door. When Vincent’s dad unlocked the Formosa at 7 a.m. the next morning, Wayne was in the kitchen preparing eggs. The talented Chef Mark Tagnipez is now in charge of Red Med at Formosa Café’s kitchen. Tagnipez had a good run at XIV and Red Medicine. 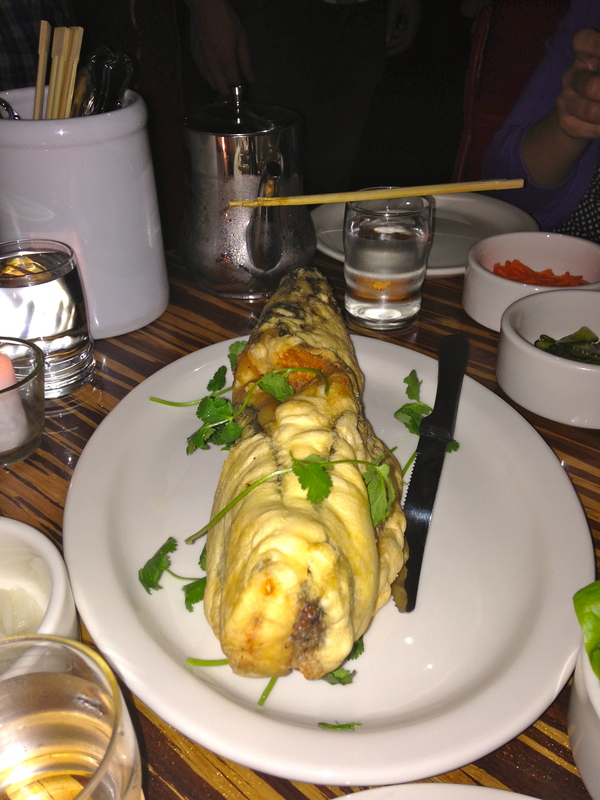 His new menu is the first of many planned celebrations to mark Formosa Café’s 75th anniversary. Some of Tagnipez dishes arrive with a lackluster presentation, yet once we took a fork to unwrap the layers beneath; we discovered spectacular treasures of wonderful flavors hidden beneath. 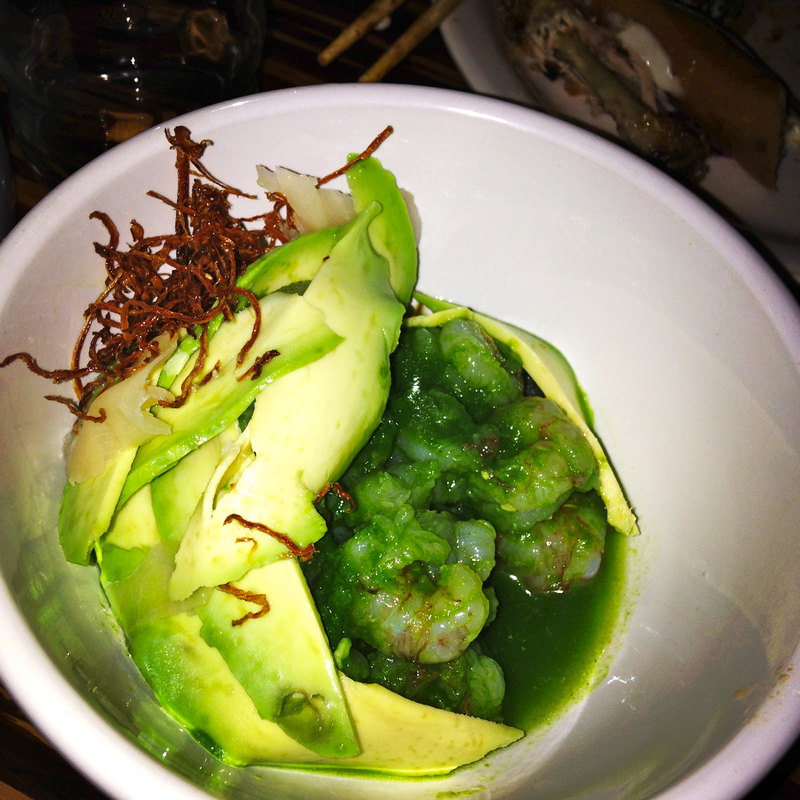 The entirely green Rock shrimp dish arrived in a bowl with layers of avocado. As I dug down, I exposed slippery, raw shrimp bathing in a green aguachile with ginger. This dish had a punch of heat after the first bite and was served with prawn rice crackers to scoop up the mixture of goodness. When we spooned the marinated eggplant onto our plates, it didn’t look like much, yet the vivid flavors of garlic, sesame, and celery almost vibrated in my palate. I enjoyed the ethereal Shanghai rice cakes that tasted like little chewy dough pillows dusted with bacon, shishito and Thai basil. The chicken wings are a Red Medicine recipe rolled in flavorful crumbs, fish sauce lime and Thai chile, that spices the wings with aromatic flavors. The crispy spring rolls are deep-fried and stuffed with a healthy dose of crab and Asian herbs. Everyone at the table enjoyed the oyster mushrooms with crisp haricot vert beans, and a French chili pepper from Espelette mixed in with the oyster sauce. Large parities may want to go straight to The Group Effort column on the menu for plates of tender Wagyu Beef Brisker braised in a secret plum sauce for 36 hours or a deep-fried whole black bass that arrives whole. The server filets it to reveal light-colored and moist fish with a crispy crust. These dishes easily feed three to four guests. Before leaving, Billy Ray shared one more story. In the 1990s, the restaurant was threatened with demolition when its lease expired. Bono from U2, a frequent guest, was one of the citizens who spearhead a preservationists effort to keep the Formosa a landmark at its original location. Bono has been coming into the Formosa for years, because he enjoyed a waitress from Ireland named Cassie. 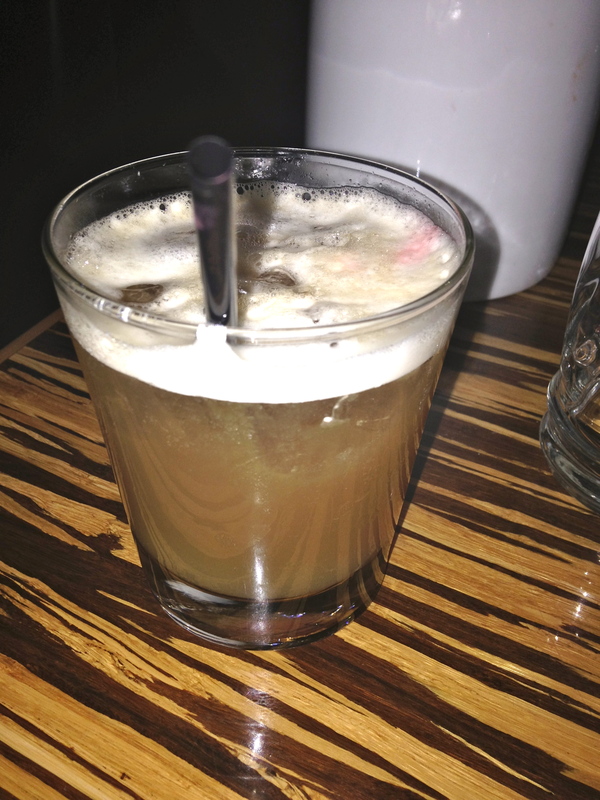 She passed away a few years ago and bartenders continue to make a specialty cocktail, To Cassie With Love, in her honor. 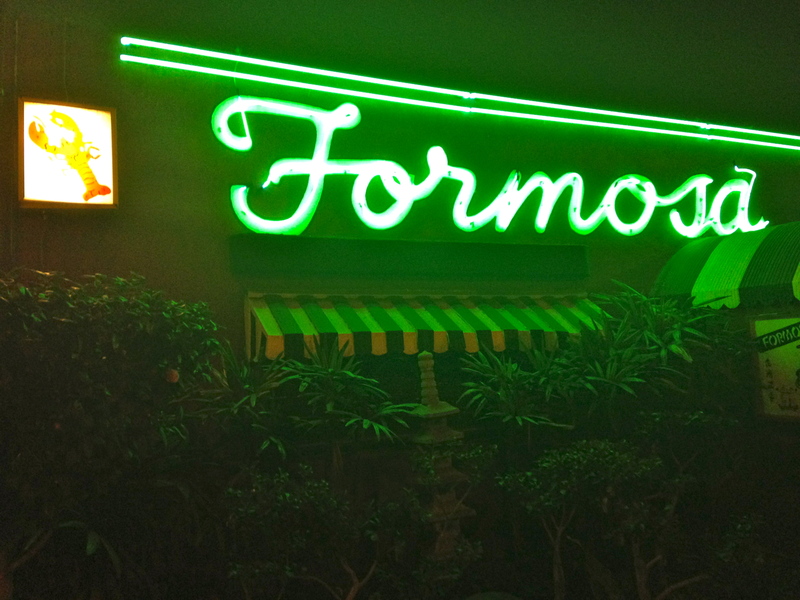 The Formosa Café is open for dinner at 4 p.m. until the 2 a.m. “last call.” Parking is available in the West Hollywood Gateway parking garage. $$ 7156 Santa Monica Blvd. (323)850-9050. **This article was published in the February 6 edition of the Beverly Press and Park LaBrea News.